Merry Christmas! This morning I would like to express my appreciation for ALL the wonderful guests we’ve had over the years. 2008-present has been a struggle financially, and recovery of the economy did not “trickle down” to Dunsmuir until 2017, and even then, not for all of us. It takes a long time for those pennies to fall from heaven, where, apparently, the wealthy, live… That being said; we learned the hard way to save for winter like it was our last summer, and treat every guest like they are regulars. my mother, Donna Parsons started this program of saving and was the gatekeeper of the money, because up till then, we’d just poured all our money into this place and had no real idea how to save. The lodge still needed upgrades, but we were in survival mode. Through this I’ve never forgotten it’s you, our guests, who makes us great by your patronage. This year I’m starting to dream about what the Dunsmuir Lodge could become again. I haven’t done that since 2008. Maybe one day there could be a second story, pool, and restaurant! This year we did a few much needed repairs ($$$), and are now working on some interior touches in our premium rooms (formerly called “renovated”). We will eventually put finishing touches in the standard rooms also. 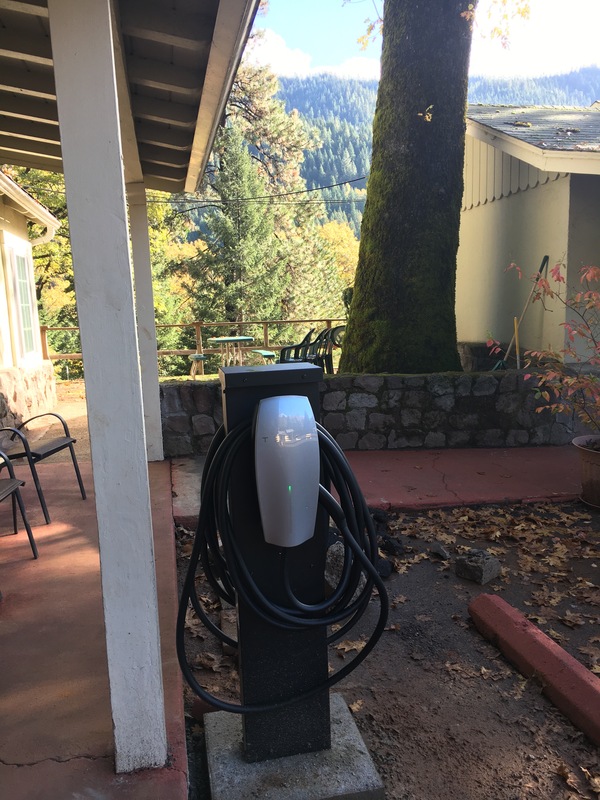 Probably the biggest news for Dunsmuir Lodge in 2017 is the new TESLA car charging station, with adapter for all other cars, too! Dunsmuir is firmly planted in the 21st century now, and ready for the electric highway! Thanks to all the hard work of our housekeepers, who keep the rooms nice and clean for you, our hospitable and helpful office staff, and myself, you still love us and keep coming back year after year! We will keep striving to be the most comfortable place to stay for people visiting the area. Thanks to everyone who has ever stayed here for your support! 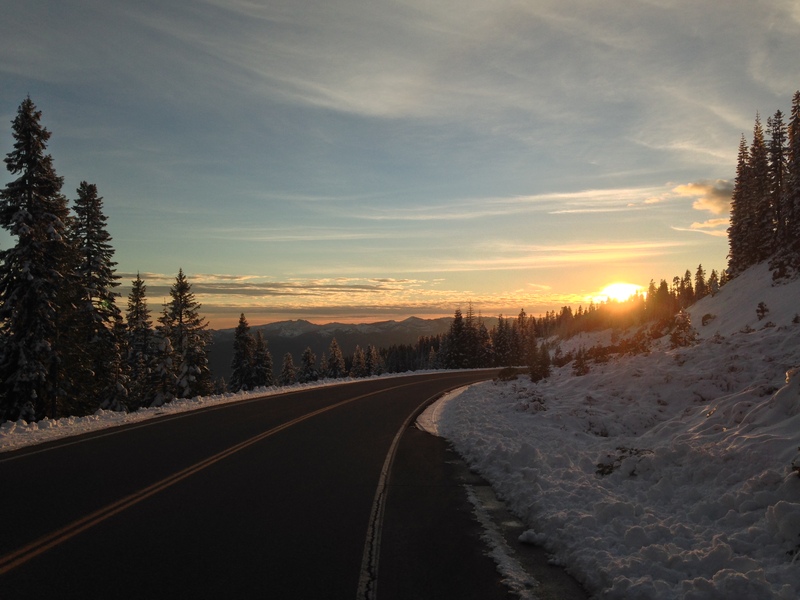 How to see the snow and a beautiful sunset at the same time halfway up Mount Shasta. 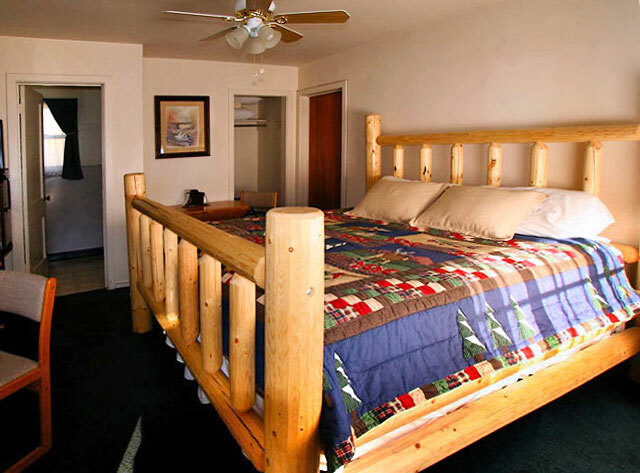 Bunny Flat provides hiking, camping, and winter sports. Quick easy access and plowed roads means that anyone can get up there most days of the year. 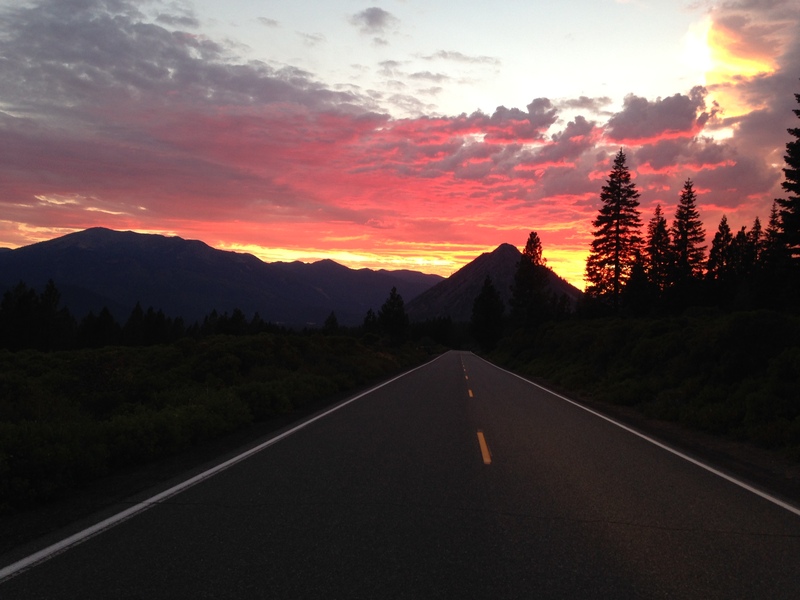 It will show up on most map apps and is at the top of Everitt Memorial Highway, going directly up the mountain out of the town of Mount Shasta (8 miles north). While the view has been similar to this picture lately, we are expecting snow off and on throughout February, so check when traveling through. Come stay at the Dunsmuir Lodge for free tour suggestions and directions ! Just imagine drinking your morning coffee, latte, mocha, cappuccino, mochaccino, machiatto, chai, chai latte, or whatever gets you going in the morning – to this. 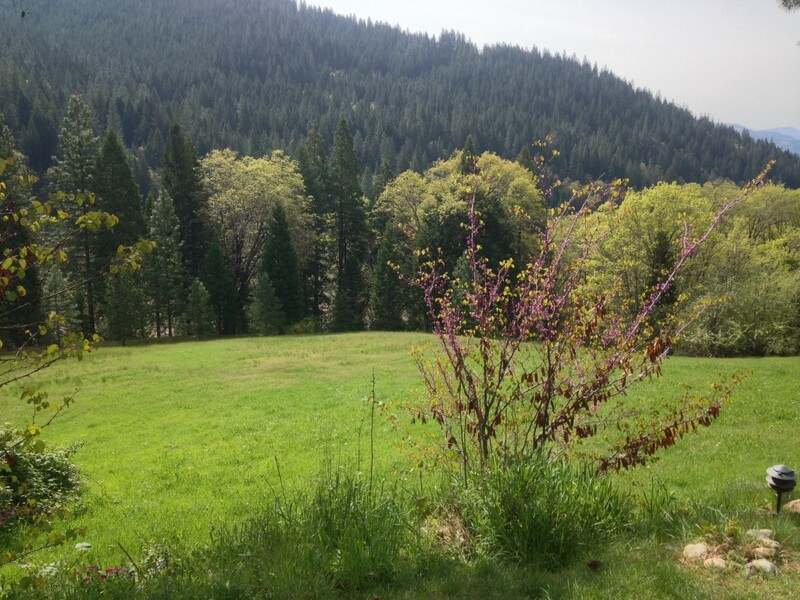 Fishing Season is in full swing in Dunsmuir! Mike L., from San Francisco, fished the Upper Sacramento River today in Dunsmuir. He caught a 13″ Rainbow Trout. He’s pretty happy, and says he will return to do some more fishing. Dunsmuir City is stocking the River with fish. Fish can be measured and tagged at Dunsmuir Hardware. At the end of the season there are prizes awarded in several categories. It is looking like summer will be one of those “perfect” summers here in the mountains. Lots to do, excellent weather, lakes full, forests green, and fishing great. Come up and enjoy the clean air and water, not to mention the serenity all around. Ski Park Open at Last! We thought Winter would never come, but now it has arrived with a big snow storm and the Mt. Shasta Ski Park is officially open for business. Skiers are flocking to the mountain looking for their usual winter sports. We have ice skating and cross country skiing at Castle Lake, and all the usual alpine sports on Mt. Shasta and in the Ski Park. As we have noted in the past, the trip from the Dunsmuir Lodge to the Ski Park is 15-20 minutes. We have great restaurants here in Dunsmuir to enjoy for breakfast, lunches and dinner and the Dunsmuir Brewery often has music and of course, fine microbrews to enjoy, as well as excellent food. Prices at the Lodge are reasonable all year round. If you are coming to ski, please let us know and show us your ski pass after the first day for a “skiers’ special” of 25% off for your stay. Stay and Play! 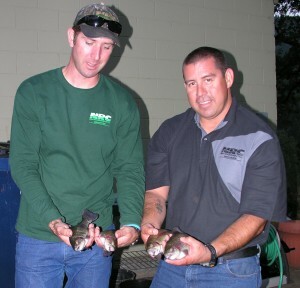 The city of Dunsmuir is now stocking the Sacramento River with trophy sized fish! Fishing has been less than stellar in the early part of this season due to high and fast waters. The river has calmed a bit by now, and the fish are plentiful! Come and enjoy the fishing opportunities that abound in our area. Tauhindauli Park is located at the north bridge in Dunsmuir. Easy access and picnic areas make this a great family fishing spot. Mala Wilson, age 9, pictured above, had the first reported catch from Dunsmuir’s big fish stocking program started on Friday, the 15th of July. Although this cold weather doesn’t say so, summer will come soon! June is just around the corner and we invite you Dunsmuir’s Railroad Days celebration. It is our tradition here and a great way to launch summer vacations. The historic Shasta Daylight train will come back to Dunsmuir for the celebration. Excursions are starting from Emeryville, CA with stops along the way, including Martinez, Sacramento, Orland, Chico, and even Redding! So you are almost never too late to hop on that train! 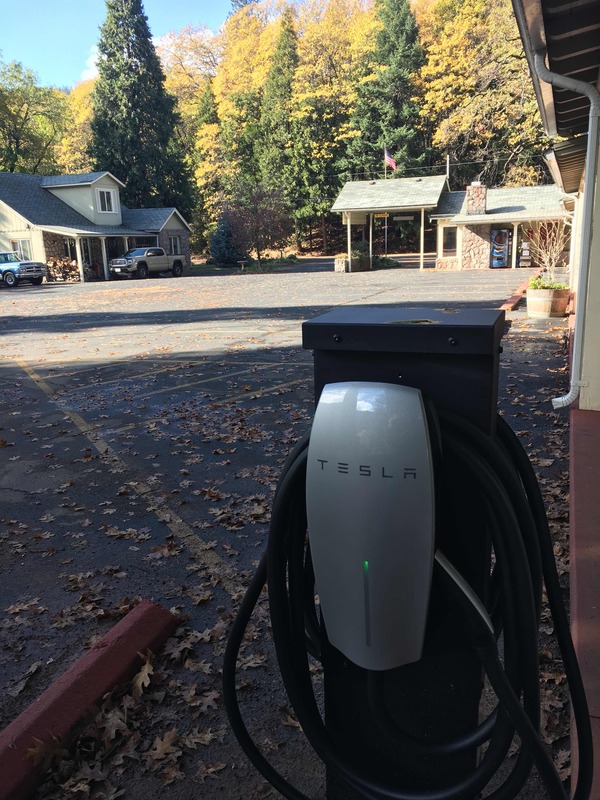 While in Dunsmuir, travelers will stay in the area and return by rail on Sunday. Saturday night the Shasta Daylight will host a dinner trip north to Black Butte where the train gets turned around for the return trip on Sunday. Here is a link to the site hosting the excursion where you can get detailed information on tickets, costs and schedules. If you wish you can call 800-359-4870 for information also. We look forward to seeing you!